It’s no wonder he’s so upbeat: LaMontagne’s fourth studio album, “God Willin’ & The Creek Don’t Rise” comes out today, and he says he thinks it’s his best yet. Having been a professional musician for close to a decade, this is the first time he’s recorded an album with a dedicated band, though he says he’s always collaborated with other musicians and rebuffs the idea that he is a solo artist. “You could maybe have called me a solo artist eight years ago when it was just me driving around in a rental car with my harmonica and my guitar. But those days are long gone,” he says. LaMontagne is accompanied by The Pariah Dogs, which includes musicians Jay Bellarose, Jennifer Condos, Eric Heywood, and Greg Leisz. Playing together off and on for years, LaMontagne says that together they’re like a very supportive family. Originally from New Hampshire, he had been working in a shoe factory in Maine when he took a chance on a music career. He’s had three successful albums since then, starting with 2004’s “Trouble”, and the 2006 record “Till The Sun Turns Black. But it was his 2008 soul-inspired breakout album, “Gossip in the Grain”, that brought LaMontagne into the mainstream, with his trademark sweet but raspy voice. His songs have been frequently licensed for films and TV, though he hasn’t owned one in years. He’s known for tender lyrics, but insists that his songs are not autobiographical, preferring to think of himself as a storyteller offering up music that others can relate to their own lives. 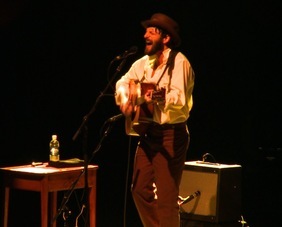 Songs on the new album were penned by LaMontagne across two months. The band then spent two weeks recording in his home studio in rural western Massachusetts, free from distractions. “It was really a matter of listening to Ray play us the songs and then everyone would just pick up an instrument,” says Greg Leisz, a member of The Pariah Dogs. The album also inaugurated another first for LaMontagne — a new role as producer. After writing all the songs, he planned in advance which songs would make the cut before arriving at the studio. Every song they recorded appears on the album. “As a musician, you’d never know that he wasn’t a producer. He knew exactly what he wanted,” says bass player Jennifer Condos. He wants that same level of artistic attention and intention to come across in live performances as well as on the album.